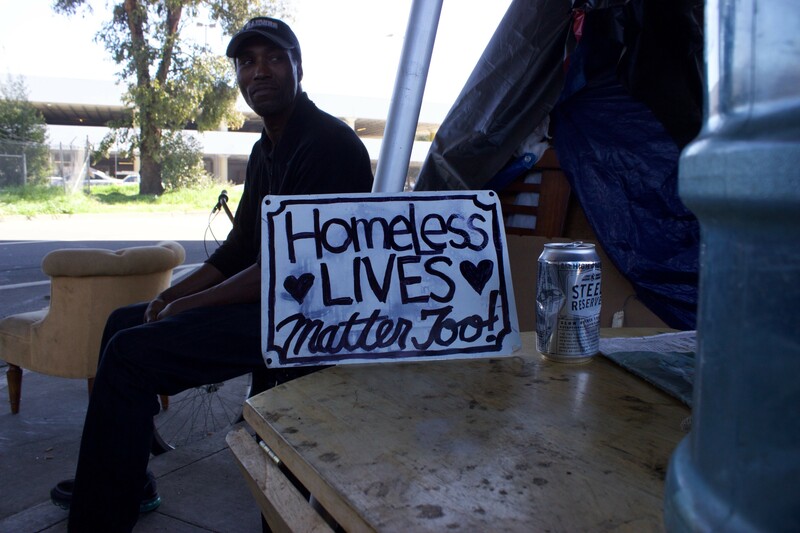 A man advocates for homeless rights at an encampment in Oakland this spring. In the early hours of January 30, some 350 volunteers went out to tally the number of people living on Alameda County's streets. Today, officials finally released results from this “Point In Time” count — and the new data is staggering: 5,629 individuals, a 39 percent increase in number the homeless residents over the previous survey two years ago. The count, of those living outdoors and in shelters, also confirms what many have described in recent years as a growing homelessness crisis in East Bay communities. "The takeaway from this count is that we have a homeless-service system that is at capacity," explained Elaine de Coligny, executive director of EveryOne Home, the nonprofit that oversaw the Point In Time. She described homelessness situation in the region as dire. "The problem is at a bigger scale than we previously understood it to be." EveryOne Home tried a new approach with this past January's count, one that they feel offers more reliable data, which is why they consider this year’s Point In Time a benchmark. This year, for instance, they employed a so-called “street blitz” technique, where they canvassed census tracts, and also partnered volunteers with 120 current or recent homeless individuals, who were paid, in hopes to better inform the process. They encountered 3,863 living outdoors, which amounts to 68 percent of the total Alameda County homeless population. The canvas was supplemented by a separate count of “transition-aged youth,” plus data from programs and agencies that serve homeless residents, including surveys of more than 1,200 un-housed people. In the past, experts and homeless advocates have questioned the accuracy of the federally mandated Point In Time count, which county's must conduct in order to qualify for certain funding. The goal in Alameda County this year was to improve the process and gather better demographic information, personal details, and an understanding of how services are used. Specifically, the new Point In Time data shows that homelessness disproportionately affects Black or African-American residents, who according to the most recent census account for 12 percent of the population in Alameda County, but made up 49 percent of the homeless population. The surveys also revealed that 15 percent of respondents had been in the foster-care system, and 14 percent did time in jail or prison at some point during the past year. Forty-two percent said rent assistance would have prevented them from ending up on the streets, underlining how access to affordable housing is a key driver of homelessness in the county. "Homeless is the worst symptom of the housing crisis overall," de Coligny argued. "The reason we have homelessness on the scale we have right now is because our housing market is too expensive." There are 100,000 extremely/very low-income households in Alameda County with only 41,500 units affordable to them. Alameda County has 3rd largest population of Extremely Low Income rent burdened in California, behind San Francisco and Los Angeles. Meanwhile, 100,000 new residents have moved to Alameda County without enough new units built. The research also dispelled a misconception, that the surge in street encampments resulted from an influx of people from other cities. Eighty-two percent of those surveyed responded that they had resided in Alameda County before living on the streets, and half of respondents had lived here for more than ten years. The number of homeless individuals was highest in Oakland; the homeless population grew by roughly 26 percent, to 2,761. Close to 70 percent were unsheltered, a 500-person increase from the previous Point In Time count in 2015. The new numbers were released as Oakland city officials are considering how best to address homelessness, and what strategies to prioritize in its budget, which will be finalized in June. On Tuesday, staff from the Human Services Department presented a list of potential options, including providing toilet, trash, and social services to existing encampments; expanding Safe Haven parking sites; and — most importantly — developing and opening a second Henry Robinson Multiservice Center, which would serve more than 300 of the highest-need individuals, and house roughly 80 percent of them. Altogether, the aforesaid plans would cost more than $2.5 million a year. The mayor's current budget proposal only allocates $250,000, however, though funding could be supplemented by county, state, and federal dollars. Members of the public and City Council are pushing for more. Meanwhile, De Coligny hopes to see more people ready to fight against cuts coming from the Trump administration, which could decrease already limited resources. "Everyone deserves the dignity of a home," she said. "That is going to take public investment and also private support"
But it's unclear if anything will be done — even though more raw sewage flowed into Lake Merritt twice in the past month.